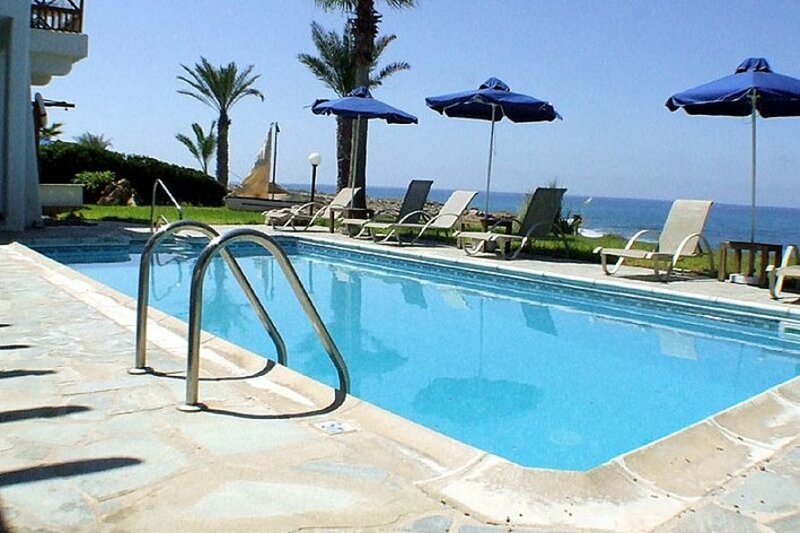 The villa is situated just a few meters from the sea shore. Already while entering the villa you will enjoy the fantastic sea views through the wide patio doors. On the ground level there is a comfortable, tastfully decorated living area with a live open fireplace. Here you will find a large flat TV with Satellite (limited channels), DVD and music station. The open plan kitchen is well equipped and ideal for everyday cooking. Even from the dining table you can enjoy the lovely views to the sea. On this level there is a cloak room and an ensuite twin bedroom. Just a few steps down, on pool level, is the master bedroom with en-suite jacuzzi bath and access to the pool area. The third bedroom with ensuite bathroom is situated on the upper floor, has access to a balcony and an outside staircase to the terrasse. All bedrooms and the living room are equipped with air-conditioning (extra charge), for the colder winter period are electric wall heaters available. The covered tarrasse is furnished with quality wooden garden furniture, a few steps are going to the heatable pool (8x4 m) with roman steps. At the pool you will find sun loungers and umbrellas. There is a large lawn, ideal for children to play.